Product categories of 18 Ton Forklift, we are specialized manufacturers from China, 18 Ton Forklift, 18 Ton Forklfit Truck suppliers/factory, wholesale high-quality products of 18 Ton Heavy Forklift R & D and manufacturing, we have the perfect after-sales service and technical support. Look forward to your cooperation! SHANTUI brand 18 Ton Diesel Forklift which model is SF180 is widely used in ports, docks, steel mills, stockyards, airports, underground mining areas, logistic parks, etc. It`s powerful and efficient for transporting and loading heavy items and containers between short distances. The overall design of the whole forklift is advanced and the structure is reasonable. The chassis adopts the international mainstream configuration, the quality is reliable and performance is advanced. Hydraulic system adopts integrated multi-channel valve, high integration, energy saving and good maintenance. The cab adopts hydraulic tilting structure and tilting type hood to improve the maintenance performance, internal design layout fully comply with ergonomics, operating environment is more comfortable and safe, greatly reduce the labor intensity of drivers. Adopts USA Cummins QSB6.7 full electronic control engine, in line with European Ⅲ emissions standards, powerful, advanced performance, high reliability, low fuel consumption, maintenance is convenient. Choose the American PARKER products. High integration of hydraulic system and convenient maintenance; Pilot remote control, maneuvering light and saving power; The system is equipped with a thermo-controlled cooling device, which can meet the requirements of high intensity and high reliability. The German ZF 3WG171 electric liquid control gearbox, power cut function, make the micro-dynamic control easier to realize; Fault code display, which can quickly query the cause of failure by fault code, greatly simplifies maintenance. Adopts CAN bus technology, the controller can transmit the fault information to the monitor in a timely manner, display its fault code and alarm in the form of flashing alarm lights, and have the function of historical fault inquiry. Integrated electric control module for easy maintenance; Walking control can be performed manually and automatically according to personal habits. The operating pedal and handle position are designed according to ergonomic principle, and the operating environment is more comfortable and safe. High setting (seat height), large glass area, better view, can reduce labor intensity greatly; Warm and cool air conditioning. 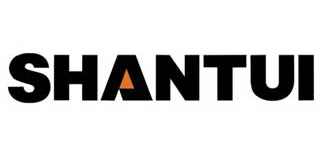 Shantui products including diesel forklift, Electric Forklift, Heavy Duty Forklift, Gasoline Forklift, container forklift, Side Loader , Pallet Truck , Construction Machinery including shantui bulldozer, Wheel Loader , Crawler Excavator, road roller, generator set, motor grader, truck crane, Construction Machinery Parts, Shantui Parts, Cummins engine parts, komatsu parts, and other machinery parts.